Preparing for a beautiful outdoor wedding? Everything has to look refreshing and most of all, seasonal! For a spring wedding day in a garden, a backyard, park, tree, on a field, mountain, hill or on a beach, you have to make sure that the reception is all decorated properly. Here are a few tips about the wedding chair flowers. If your wedding is going to take place in the middle of the nature, with no certain frame to limit your wedding location, you have to do anything in your power to arrange perfectly the wedding set. Soon as you finished decorating the way along the aisle, you must take care of the chairs. They have to wear the same floral mark of the wedding theme and to match the seasonal flowers. Decorating the chairs is one of the most beautiful parts of the wedding. You must be careful with them and create a splendid, romantic and intimate atmosphere around the place for your guests to feel comfortable. What better way to evoke an elegant, welcoming and inviting wedding décor than to decorate the chairs with fresh seasonal wedding flowers! 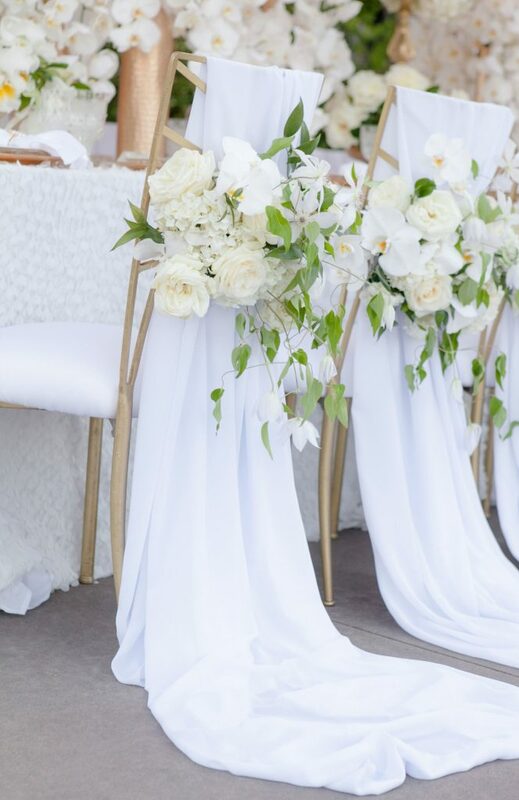 After you finished covering the chairs with a matching fabric, you can tie the bows and dress them up with real natural flowers, greenery or artificial silk flowers. Wedding chair flowers can be very expensive if you decide to involve your florist and ask him to take care of the chairs. To reduce the costs sand save some wedding budget for your wedding dress for example you may ask your family, fiends and neighbors to offer you flowers from their garden and come help you up with the arrangements. If you won’t find any help from friends, you can skip some chairs and decorate with flowers only the second or the fourth one. There are lots of ideas for you to stay within the wedding budget, you just have to consult with your wedding planner or family and ask their opinions. If you have enough money to decorate the whole outdoor wedding you can always call for a specialist in field and have your wedding fresh and beautiful decorated. Wedding chair flowers are usually used at the end, and remain an option for the whole decorating process. 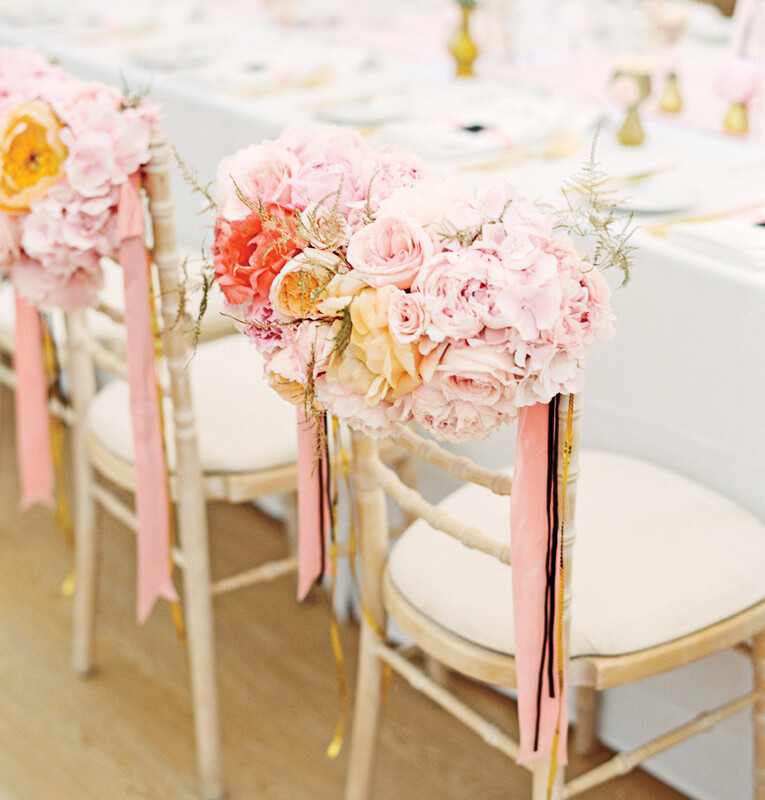 Once you have covered the chairs with ribbons and bows and still they look gorgeous, you can skip the flower adornment process. This is a variant for couples who are trying to save money for other things. You can use satin, silk, tulle, or other fabric for the ribbons and bows. You can add a single flower on top of the bow, or two or three flower-steams, depending on their blooms and length.